Being pregnant means you put a lot of focus on the baby. However, you may have heart disease and not even realize it. This could put both at risk. Often, women take great care in taking the right vitamins and prenatal supplements to encourage the growth of their child and ensure that the baby is developing healthily. Unfortunately, they might not realize that their own bodies are giving them signs during the pregnancy that something is not right with them. The underlying factor(s) could end up not just harming the baby, but even causing the death of both mother and child. Because it’s so easy to mistake the symptoms of a heart attack or heart disease with symptoms of pregnancy, it can be easy to just write off unpleasant symptoms that you are experiencing. However, you should keep an eye out for symptoms like shortness of breath, palpitations, heartburn, and swelling. While these may be common during a pregnancy, if they occur regularly or don’t seem to be stopping, it could be a sign that there is something wrong with your heart. There are other symptoms as well, such as nausea, vomiting, dizziness, abdominal pain, and an overall feeling of weakness. Pregnancy takes a heavy toll on the body, so it can be quite easy to dismiss these symptoms as being related to the pregnancy. However, you should be sure that you keep tabs on not just your baby but yourself, too. Understand what is normal and what may be out of the ordinary. Considering that both your and your baby’s life are on the line, it’s always best to be doubly sure than to be sorry. Since heart disease is the number-one killer of pregnant women, you should keep in mind some of the possible causes of developing heart disease. For one, it could come about simply because you already have cardiovascular problems. If you already suffer from heart disease, the chances that the disease will become worse during pregnancy are high. After all, your body goes through quite a bit of a transformation during pregnancy. It produces more blood, especially in the third trimester, and that means your heart is working overtime to pump it through your body. It causes quite a strain. 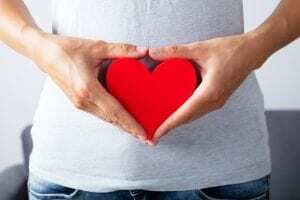 Heart disease may also develop because of your age. It’s become more common for women to become pregnant later in life. While there is certainly nothing wrong with that choice, it does make the chances of developing heart disease higher. It’s merely an unfortunate consequence of aging. As you become older, so do the risks of having a heart attack or developing cardiovascular disease. One last possible cause that could increase the risk of developing heart disease while you’re pregnant is obesity. Simply put, obesity is growing among Americans—both in men and women. However, for mothers, obesity is especially problematic. It can increase the risk of developing diabetes, hypertension, and developing heart disease. All is not lost, however, if you fall under some of the higher-risk categories. For one, it doesn’t necessarily mean you are absolutely going to develop heart disease and potentially die. However, in the interest of your child and yourself, you may want to consider some of these preventive methods to protect your heart. For those with preexisting conditions, there are numerous surgeries available to help your heart. They are safe and have been proven successful. So, before you have a child, if you already have a heart problem, take the time to have doctors fix it up so that you can have a healthy heart that is able to support a healthy pregnancy. For those who fall into the obesity range, you may want to explore ways to lose some weight before you become pregnant. Not only will this make you healthier overall, but your heart will be strong and healthy to help you carry your child to full term. Perhaps one of the best measures you can take is to watch your diet. Eat well, nourish your body, and it will treat you right. If you notice a troubling change, contact your doctor.